Changing landscape and climate have forced communities to adjust the way in which they prepare for water-related crises. In the coastal region surrounding New Orleans, planners face an even greater challenge in solving how to reduce flooding caused by rainwater falling inside of existing flood protection infrastructure like levees. 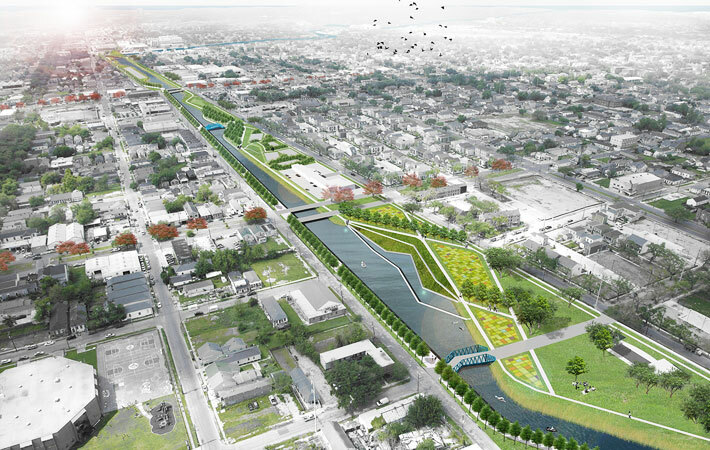 The Greater New Orleans Urban Water Plan addresses management of stormwater, surface water, and groundwater within levees in an innovative and regionally specific way. The Urban Water Plan is the first regional water plan of its kind in the country. Comprising three overarching volumes and 26 separate reports, the Urban Water Plan was developed out of a process that considers soil, water, and biodiversity; existing water and other infrastructure; and the makeup of the urban space in Greater New Orleans, also understood as landscape typologies. The project area includes three hydrological basins covering 155 square miles of urban lands plus 69 square miles of impounded urban wetlands. The Urban Water Plan is innovative not only for being the first of its kind, but because it is an elemental change in the region's approach to water management, from fighting water to living with water. A vision with urgency and significance to many sectors, agencies, and people, the Urban Water Plan requires wide-ranging efforts to achieve the necessary knowledge and support needed for its implementation. Planners have been instrumental in communicating with designers and engineers about the spatial, socio-economic, political, and cultural impacts of the plan. They have also been successful in integrating the Urban Water Plan with the Louisiana Coastal Master Plan and other local planning processes. Joining the Orleans and London Avenue canals, the Lafitte Blueway becomes an essential part of an interconnected waterway network, providing drainage, circulating water, and bridging between disconnected communities. Before implementation could begin, architects of the plan were tasked with educating key stakeholders — elected officials, professional associations, and the public — about the process and benefits, and ultimately to gain public support. Working with the Urban Water Plan Advisory Board, composed of representatives from the Environmental Protection Agency (EPA) to the Greater New Orleans, Inc., the team conducted more than 50 outreach meetings with community members from all parishes of New Orleans. In the summer and fall of 2012, architectural firm Waggonner & Ball curated the Living with Water exhibition, which provided yet another opportunity to educate the public about the Urban Water Plan. Continuing still, outreach targets children in elementary schools to graduate students at Tulane School of Architecture, and through the Greater New Orleans Water Collaborative pursues actions to develop the industry and implement the plan. Through its outreach efforts, the Urban Water Plan team is building a foundation of support for implementing the plan. In its final format, the Urban Water Plan put forth system improvements, demonstration projects, policy recommendations, and funding mechanisms. New Orleans metro region and the surrounding communities have already begun to see positive outcomes from the Urban Water Plan. It was the dissemination of the Urban Water Plan that helped the city become one of eight RE:invest Initiative cities providing New Orleans with over $2 million in financing to implement green infrastructure. The plan is now the basis for the area's applications in the National Disaster Resilience Competition. While the city will not soon forget the devastation it felt in the aftermath of Hurricanes Katrina and Rita, New Orleans has been able to use its understanding of esilience planning to prepare for a future that, rather than fighting the water, lives and thrives with it. Steep canal banks can become tree-lined terraces. 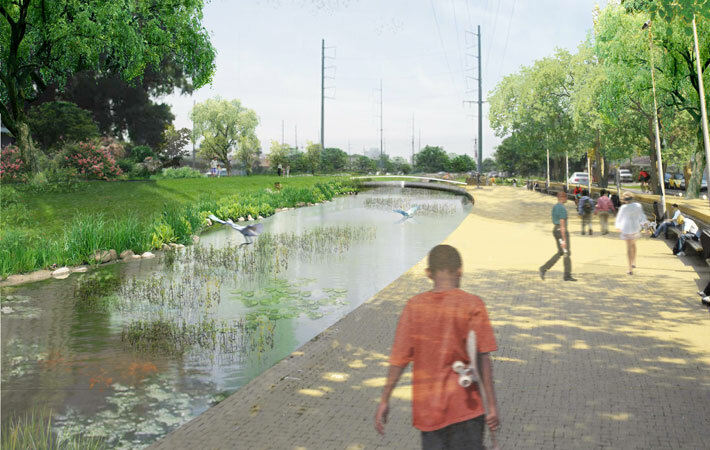 In some cases, there is enough space to insert a pedestrian pathway and other features that allow parish residents to enjoy the canals as beautiful amenities and public spaces such as the West Esplanade Canal in Jefferson Parish.